You are currently browsing all posts tagged with 'faceup'. i love doing face ups and seeing how i improve with practice, but always hated adding the lashes ’cause i just couldn’t seem to get the hang of it. it would usually take half an hour of fighting and glue everywhere! not to mention i would be unhappy with the result. so when trying on a dress caused ember’s lashes to come partly unstuck i decided to try andreja’s method and it worked amazingly. who would have guessed that cutting them in pieces and using tweezers instead of trying to push a full length strip into place with a toothpick made such a difference. less than a minute per eye and i have perfect lashes! If at first you don’t succeed, you are running about average. that seemed an apt quote for what i’ve been doing lately. i want to get an etsy store up and running but i seem to be running in circles instead. i’ve been making up a bunch of crocheted hats for pukifee and littlefee sizes (sneak peak under crochet) so i decided i should get faces on some of my other kids to give me a wider range of models. i finally got my littlefee pipi and bid elin done after three days and 3-4 wipes each. i kept getting fuzz in the msc no matter how carefully i cleaned (i want a hermetically sealed room for faceups! 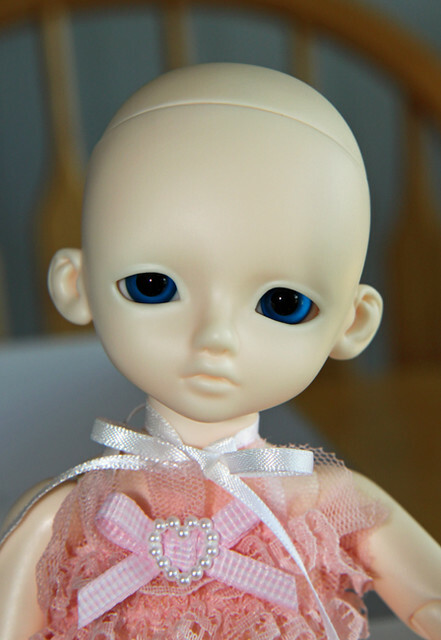 :lol:) i’m very pleased with the results but if these had been my first face-ups. i’m not sure i’d have ever tried again. my red-haired freckly girl seemed to cry out for a celtic name so i have tentatively called her eilidh (eh-lee) but i’m not completely sold on it. she still may end up as polly which was her planned name, i just don’t know. any thoughts? tiera is a luts honey delf, pitta. it’s a very sweet sculpt and a lot of fun to play with. 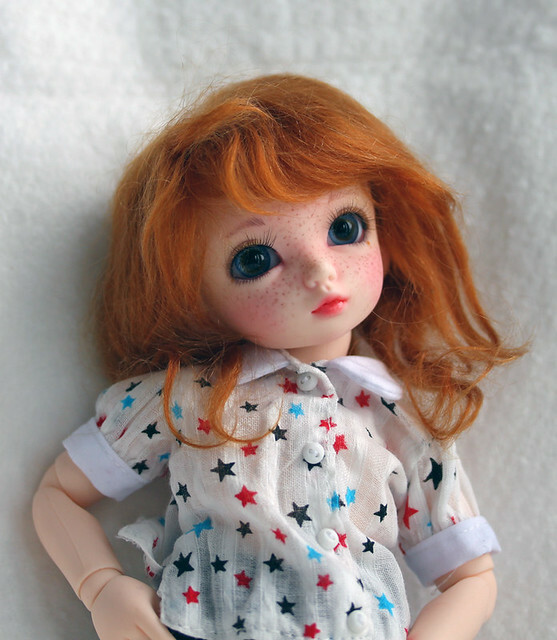 i found it hard to pick a wig for her once her faceup was done. 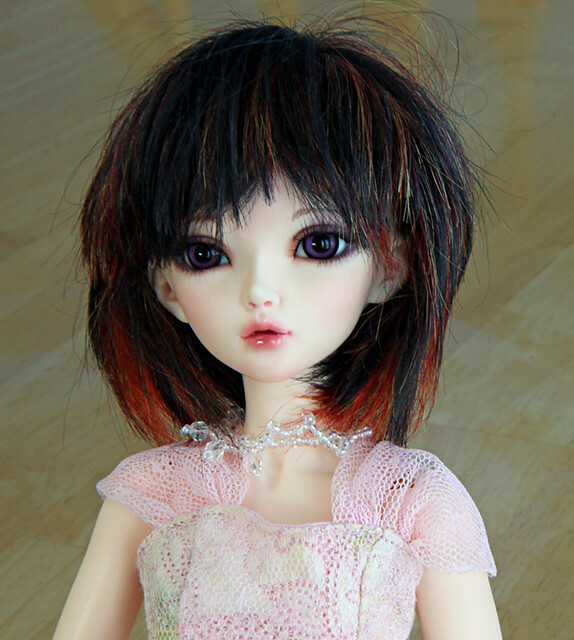 her head was smaller than i’d expected and her new coloring didn’t suit the wig i had ordered with her. my final choice, the pink wig she is wearing, was cut down from a kemper raven. the bangs were way too long- they covered her eyes- and the wig dragged on the floor in the back. i trimmed the bangs and cut the back to a more wearable length. 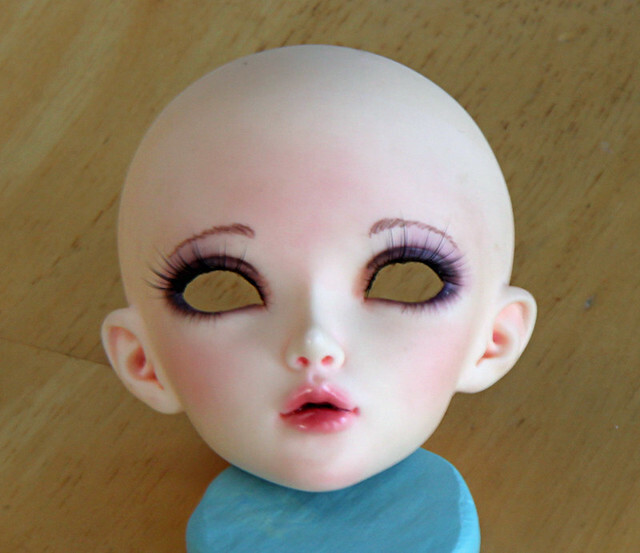 i’ve ordered a couple of black/dark brown wigs for her that i hope will work. i like that color on her as well to my surprise ( i thought since she looked so good in pale pink that she would end up a blonde -but the dark was MUCH better). i like my girls to have at least one fantasy color and one ‘normal’ color for variety. unfortunately the only dark wigs i had in that size were too heavy for her features, so i’ve ordered a soft mohair wig, which i think will suit her much better. i am quite happy with her overall look right now, very delicate and girly, and look forward to lots more photoshoots.